Raritan 2-port Model, Console: USB, Targets: USB & PS2, USB 2.0 Hub, audio, comes with (2) PS2 cables. USB Cables are optional. 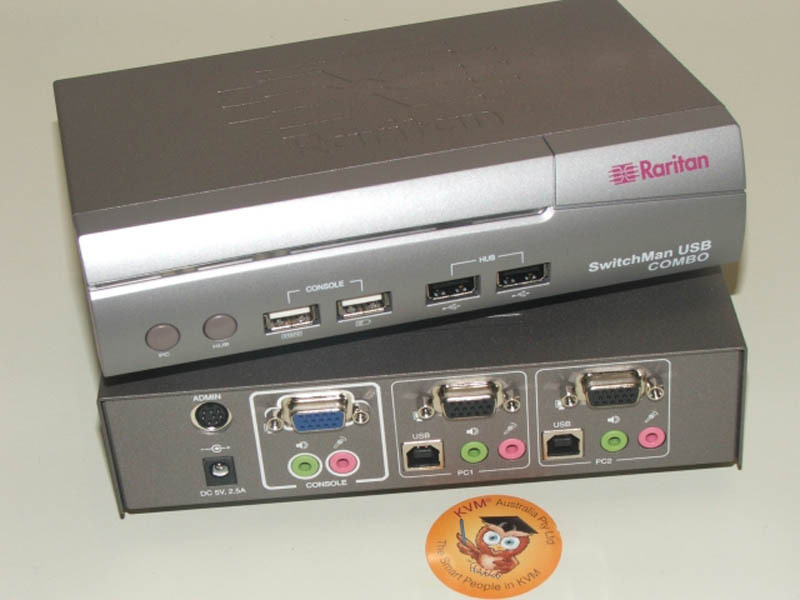 The Raritan SwitchMan SW2-USB-COMBO allows control of up to2 USB or PS/2 computers from a single USB keyboard, video and USB mouse (KVM) console. The SW2-USB-COMBO USB switch has a built-in USB 2.0 hub which allows multiple computers to share USB supported devices such as scanners, digital cameras and printers. Its audio capability lets you share a single microphone and stereo speakers regardless of which computer you connect to. The SW2-USB-COMBO supports Macintosh computers but will not support Sun computers. The SW2-USB-COMBO and SW4-USB COMBO have limited manufacturer support for newer systems.